Soccer at any level is a game of confidence. When you have it, you’re unstoppable. When confidence sinks, you don’t perform up to your capabilities. But confidence for many soccer players is too fragile or fleeting in our opinion. 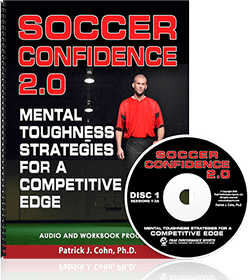 Too many soccer players allow their confidence to go up or down rapidly based upon immediate results and circumstances during competition. These soccer players have an unstable level of confidence, which will slow you down on the field. When these players perform well, they feel confident about their skills. When they perform poorly (or not up to expectations), their confidence can dip quickly. 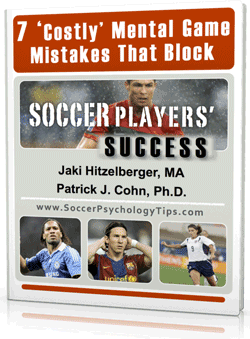 At Soccer Psychology by Peak Performance Sports, we receive emails from soccer players and parents often about how their confidence is shattered after just one bad game, missed penalty kick, or poor performance. When you allow your confidence to slump after one or two mistakes, your confidence will constantly be changing. We would argue that fragile self-confidence or letting results or circumstances influence your level of confidence in the present moment IS NOT true confidence. Real self-confidence is stable, long-term, and lasting, even under adversity or poor results. Your self-confidence should be based on years and months of soccer training, practice and competition. We know that confidence varies for soccer players and that losing confidence at times can happen, such as after an injury. When you have momentum, you ride a massive wave of confidence and can feel superior to the opposition. However, when you struggle to play up to expectations, you can lose some confidence. The key is to create a stable level of confidence that does not fluctuate based on your performance in the last game. Stay focused on your next game or practice and draw from all of your years of experience, not just yesterday, to feel confident. 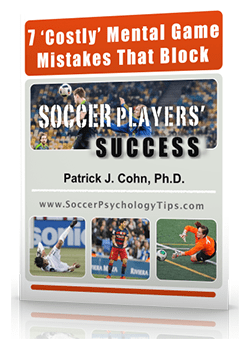 Use mistakes or mishaps as an opportunity to improve your game instead of being self-critical of your performance, which hurts your soccer confidence. When you are overly self-critical of your performance, you cripple your own confidence. Always look for opportunities to turn around your performance in a game when not performing well or when down in a game. Just one goal or great play can spark your game and give you the opening to harness momentum. We tell our soccer players not to look too far in the past. Don’t focus on what is in the past that you cannot change. Refocus as fast as you can on the next play, practice, or game. Focus on doing betting in the future without being critical of your game. I am 40 years old. I have been playing soccer for 3o years. I play really well in practise. Even against the best players in my club. But in games I can’t play well , I make mistake after mistake. Many times I want to quit after a game. But I just can’t quit. I love it too much. I’m lost don’t knew what to do. Please help. Please download our free report and see what you may be missing.